Thoughts on the Fall and the Flood in Cajun Country. 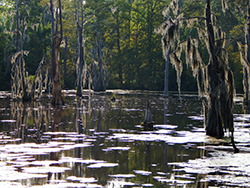 Down in the bayou, spring comes around mid-March, but no one takes it seriously. Within a couple of weeks, the temperatures are so hot that everyone has forgotten spring. It is like a ghost, barely there when it is there, and barely remembered when it goes. The season that came before spring is hard, by the way, to call winter. It just isn’t cold enough by northern standards. Some of the trees down here do drop their leaves in the colder months. Maybe they do it just for fun. The people and fauna and flora of the Louisiana bayou all have a tendency to quirkiness. The fact that some of the trees pretend to a more northern nature is looked upon with indulgence.